Two cardboard boxes sat in the auditorium lobby of Berner Middle School in the Massapequa School District: one decorated for the Los Angeles Rams and the other for the New England Patriots. The boxes started out empty but quickly filled up as the Chiefs Challenge Club hosted its annual Souper Bowl collection. Berner took part in the national initiative that helps restock food pantries following the holiday season. Students and staff could donate non-perishable goods from Jan. 28 through Feb. 1, placing the items in the box of the team they felt would win the Super Bowl. The Chiefs Challenge Club, led by advisers Marisa Boulukos and Caroline Glynn, promoted the food drive by making posters to hang around the school and gathering facts about hunger on Long Island for the daily announcements. All donations were given to the YES Community Counseling Center food pantry in Massapequa. 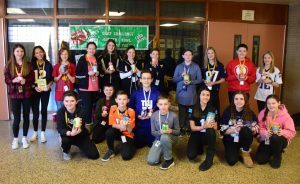 Photo Caption: The Berner Middle School Chiefs Challenge Club held its annual Souper Bowl food collection.